It was over to BrewDog Shepherds Bush on Saturday night for the Magic Rock tap take-over. That's 25 different beers, ranging from 2.6% to 11% (I think), and all available on tap at the same time. As you might imagine those beers varied a bit, from the sublime to the if-you-ask-me a bit iffy, but overall the level was very high. Stars included the Villainous Vienna IPA and the Farmhouse IPA that was a collaboration with Norway's Lervig - the latter and its beers was one of the most enjoyable discoveries of our trip to Norway last summer. Also extremely good were the Slapstick "India wit" (ie. a hopfenweisse) aged in Tequila barrels, which gave it a warming depth that beautifully complemented the fruity character of the beer, and Un-Human Cannonball, Magic Rock's near-legendary and excellently balanced triple IPA. 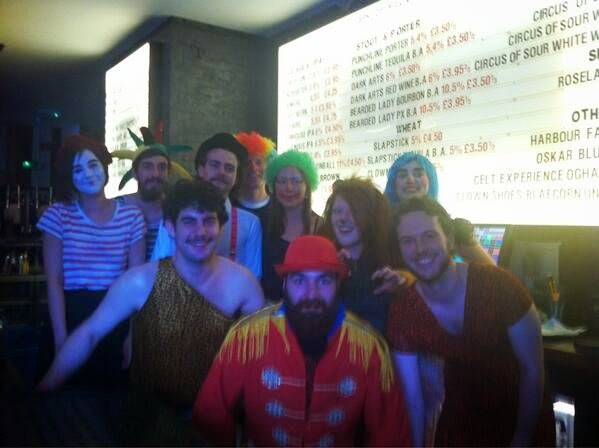 But perhaps the highest marks go to the BD Sheps Bush team, who were all in fancy dress to match Magic Rock's circus theme - from the manager as ringmaster, through a bearded lady and a very cute lion, to the mime artist who had us all applauding her ability to do table service while staying in (silent) character throughout. Photo by Jackie the LambicQueen, used by permission.